I drew up these instructions when my Boy Scout troop decided to make their own hammocks. Stuff sacks are an easy do-it-yourself project with minimal sewing skills. I often have enough left over material from other projects to scrap together a stuff sack, but you can purchase all the materials from your local fabric store or online. I found all my material from backwoodsdaydreamer.com. If you’re not into sewing, but you are in the market for a double-sided stuff sack, I highly recommend the Jacks “R” Better Speed Sacks. Great idea and easy instructions. Thanks! 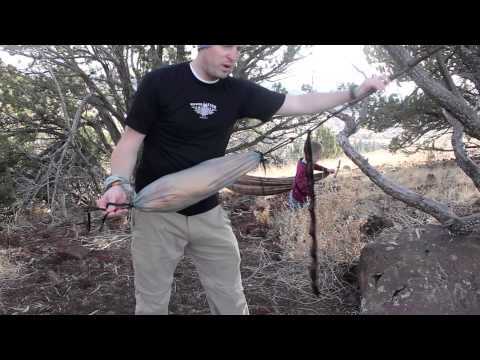 Would an asymmetrical tarp, like the ones outlined at DIY Gear Supply, fit in the large stuff sack or would you recommend making two stuff sacks, one for each side? Yes, they would fit in this stuff sack. If you make a sleeve for both sides, you’re really making a Snake Skin stuff sack. HEY…since you mentioned “snake skins” how about a set of DIY plans for various size snake skins…I really like the concept but lack the Imagineering . It’s in my new book! What book? The Ultimate Hang? Yup. The second edition is being worked on right now.